James Richard Summers was recorded in the London directory in 1851 as trading from the Curtian Road, London address. 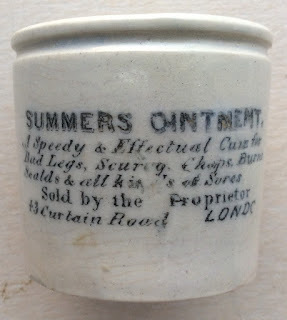 He was a chemist and produced the Summers Ointment which apparently was a speedy and effectual cure for Bad Legs, Scurvy, Chaps, Burns, Scalds & all kinds of sores! book produced by Messrs. Houghton & Priestley, page 134.